High humidity causes condensation, which in a power plant causes problems with gas turbines, pumps, switchgear and electronics. Just a few millimetres of rust on turbine shafts and layers, can cause production loss and expensive repairs. Desiccant dehumidification protect’s steam components, water quality improves, and there is less risk of corroded tubes and breakage. On offshore wind power stations the aggressive environment further increases the risk of corrosion. The dry air created by Munters dehumidification systems ensures that the power plant and associated assets are efficiently protected from corrosion and kept perfectly preserved, eg, ready for quick start up. Munters’ desiccant dehumidifer’s are used to protect electronic control equipment and bus bars from corrosion and from problems caused by flashovers. The high dielectric constant of dry air means improved isolation, consequently less flashovers and less costly related problems. During summer periods with high sensible heat loads, the cooling equipment traditionally used for keeping switchgear and control rooms dry, is no longer sufficient. Munters’ dehumidifiers are used to supplement the existing cooling systems to ensure that the humidity is controlled and contact corrosion avoided. Again, the result will be a smooth and uninterrupted operation. On wind power stations both the turbine in the nacelle as well as electronics placed in the tower can be efficiently protected against condensation and following corrosion by means of Munters dehumidification. Boilers, De-Nox equipment, gas circulators, catalysts, rotary heaters, electrostatic precipitators, wind mill towers and nacelle machinery are all parts and components subject to corrosion during periods of standby and outages. Circulation of dry air in boilers, through turbines and condensers will first of all ensure an efficient corrosion prevention at very low costs. 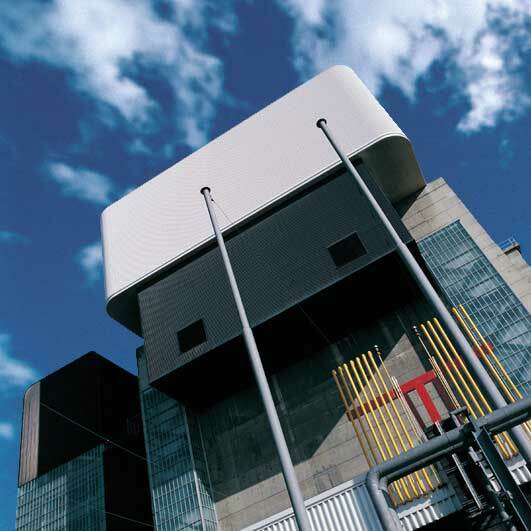 The condensation risk inside nuclear power station storage tanks for enriched boric acid is reduced with Munters dehumidifiers. The Boric acid is important in stopping the nuclear process should the plants cooling system fail. With Munters desiccant dry air systems boric acid dilution is prevented, and the yearly savings can run those several hundred euros HVDC converter halls are used in the bulk transmission of vast amounts of electricity across very long distances with low electrical loss. Humidity control in the halls with Munters air treatment incorporating Climatix linked to the building control system, ensures that secure power transmission conditions are achieved and electrical failures are reduced. 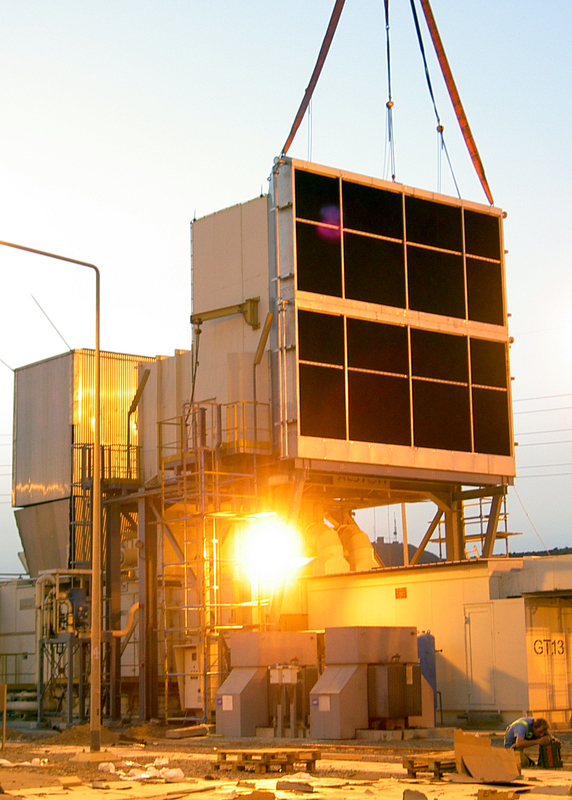 Munters GTEC Systems are designed for pre-cooling of the intake air for gas turbines. Air cooling results in higher efficiency of the turbine, so producing more energy per cubic metre of natural gas. The basic idea behind Munters pre-cooler technology is the increase of the combustion air density by reduction of the combustion air temperature - through adiabatic cooling. The pre-cooler systems are equipped with high-efficiency cooling media. * Increased power output, up to 60 per cent. The water is evaporated to pure cold vapour by the Munters pre-cooler. This produces a cooling effect which provides an intake air at higher density. This allows the gas turbine to achieve increased power output. * Low investment and operational costs, ROI at only 12-24 months. For new installations Munters is able to offer the additional advantage of integration of the intake air filtration into the pre-cooler. This substantially reduces the investment cost of both air filters and coolers by supplying one combined housing. * Simple to install, which makes them suitable for new plants as well as retrofits. * Noise reductions of between 2dB and 10dB, depending on the frequency band. * Air filtration ability. If installed prior to the first filter stage, it will remove approximately 90 pwe of the particles normally removed by the first air filter stage. Significantly increasing life and reducing maintenance costs. Dust load is reduced by about 30 per cent into the fine filters. * Low pressure drop at only 50Pa-100Pa, compared to 250Pa-1,200Pa by standard air filters. The UK's largest generator of electricity, EDF (formerly British Energy Group plc) own and run eight nuclear power stations. The gas circulators need to be checked periodically and in order to keep the power station productive during maintenance, duplicate circulators are kept on site. To prevent corrosion and deterioration of these stored circulators, they need to be kept in a controlled environment. A Munters desiccant dehumidification system is installed to remove the ambient moisture and ensure a constant and low relative humidity. This simple yet highly-efficient protection eliminates corrosion and humidity-induced electrical and electronic faults. This ensures reliable operation with fewer failures and lower maintenance costs – maximising plant availability and profitability.